Dr. Dobleman is highly experienced in treating skin cancers of the head, face and neck. 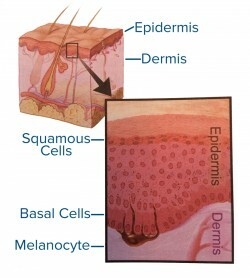 Skin cancer in general is the most common type of cancer in the United States. There are several type of skin cancers and they can show up in many shapes and sizes.The most important warning sign for melanoma is a new spot on the skin, or a spot that’s changing in size, shape or color. Also, a spot that looks differently than any other spot on your skin. If you have any of these warning signs, be sure to show Dr. Dobleman any areas on your head, neck or face that concern you.